Long before Malachy the Pekingese won “Best in Show” at the 2012 Westminster Kennel Club competition, Lad the collie had his own adventures at that annual event at Madison Square Garden. Albert Payson Terhune describes them in two tales in Lad: A Dog, a collection of 12 short stories inspired by an exceptional dog at a New Jersey kennel, which became an adult bestseller after it appeared in 1919 and which its publisher later repackaged as a children’s book. You can read “For a Bit of Ribbon” and “Lost!” online or in the attractive 1993 Puffin edition with illustrations by Sam Savitt. We’re Going on a Bear Hunt. Retold by Michael Rosen. Illustrated by Helen Oxenbury. McElderry, 32 pp., price $12.21. Ages: 1–6. Five Little Ducks. Illustrated by Ivan Bates. Orchard, 24 pp., $12.99. Ages 1–6. 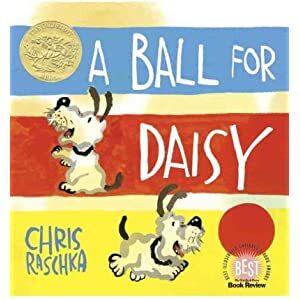 Do you know a child who is ready to move beyond Goodnight Moon but too young for the symbolism and shifting perspectives of Chris Van Allsburg? Two worthy picture books brim with elements that 1- to 3-year-olds love – animal motifs, repeated words, and easy-to-imitate sounds. We’re Going on a Bear Hunt has been delighting young listeners for nearly a generation with its retelling of a classic tale about a father and four children who go on a bear hunt. Michael Rosen’s story teems with adventures that children love to act out, such as crossing a river (“Splash splosh!”) and trudging through a blizzard (“Hoooo woooo!”). And it has dynamic illustrations by Helen Oxenbury, who has twice won the Kate Greenaway Medal, England’s equivalent of the Caldecott. 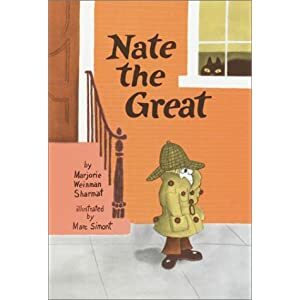 One of the few potential drawbacks to giving this book as a gift is that it is so popular that families may have a copy. Ivan Bates uses sunny pencil-and-watercolor illustrations to depict the five ducklings that wander away from their mother one by one, then rush back all at once. And he invests his animals with tender emotion without over-anthropomorphizing them or dressing them, Peter Rabbit-like, in human clothes. His mother duck is clearly heartbroken when her young disappear and overjoyed when they return. Many books browbeat children with warnings about what could happen if they don’t stay near adults. Bates takes a more subtle and perhaps more effective approach to the subject: He shows children how sad their mothers would be if they didn’t return. Best Lines: We’re Going on a Bear Hunt: “We’re going on a bear hunt … We’re not scared.” Five Little Ducks: Verses are traditional. A nice touch is that this book includes an easy-to-play musical score for the song with the same title. Published: We’re Going on a Bear Hunt, 1989. Five Little Ducks, February 2006. 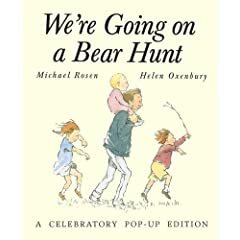 This review refers to the hardcover edition of We’re Going on a Bear Hunt, also available in Aladdin paperback, Little Simon board-book, pop-up, and book-and-CD editions. Board book editions may or may not contain the full text of the original. This a re-post of a review that appeared in November 2006. Reviews of books for children and teenagers appear on Saturdays on One-Minute Book Reviews. All are are written by Janice Harayda, former book editor of the Plain Dealer in Cleveland.